As a fan of NCAA indoor women’s volleyball, this is a tedious time of year. The beginning of the season is four months away. The 2018 FIVB Volleyball Nations League begins next month, which will offer an opportunity to watch some high-level volleyball and provide a sense of where Team USA is performing midway in “the Quad” (the four years between Olympic Games). The USA has never won Olympic gold in women’s indoor volleyball. The bronze finish in Rio (2016) was disappointing, considering that the USA won gold in the FIVB World Championship in 2014. That the USA hasn’t won gold is a testimony to how big volleyball is in other parts of the world. A small country like Serbia can produce a team to compete impressively on the international stage. Serbia knocked Team USA out of gold medal contention in Rio. And Team USA had to battle hard against the Netherlands to win the bronze. In recent weeks I’ve been drawn to the play of Imoco Volley de Conegliano, a professional volleyball team based in the province of Treviso in Northern Italy—Prosecco country. The initial attraction was the fact that they had two players I recognized from Team USA and NCAA play, Kim Hill and Samantha Bricio. Conegliano is part of the Italian Serie A, the top Italian league competing for the Samsung Galaxy Cup. They also are one of four remaining European volleyball teams playing in the Volleyball Champions League. Thanks to ESPN streaming services, you can watch them play either via live stream or, for a short window of time, on replay. I first tuned in to watch them defeat Savino del Benne Scandicci. Now they are leading 2-1 in a best-of-5 series with Igor Gorgonzola Novara. Conegliano could win the series on Sunday (9 am PT). Conegliano doesn’t quit. They lost the first match of the series. If I recall correctly, in the second match, Conegliano avoided five set points in the first set and, eventually, won. I don’t think I’ve ever seen anything like it. They ended up winning the match 3-2 in a nail-biter. It was an exciting match. Competitive. Hard fought. Conegliano never seemed rattled. Their highs aren’t too high, their lows aren’t too low. The third match (and their second win) was a blow-out. When Conegliano lost the first match of this series, they looked a bit like the underdog, but now I’m not so sure. One of the unique qualities to Conegliano is how many of their players have an effective back row attack and how often they use their back row players on attack. Usually there is a player on your team who, if you put the ball up just in front of the 3 meter line, can do some damage. 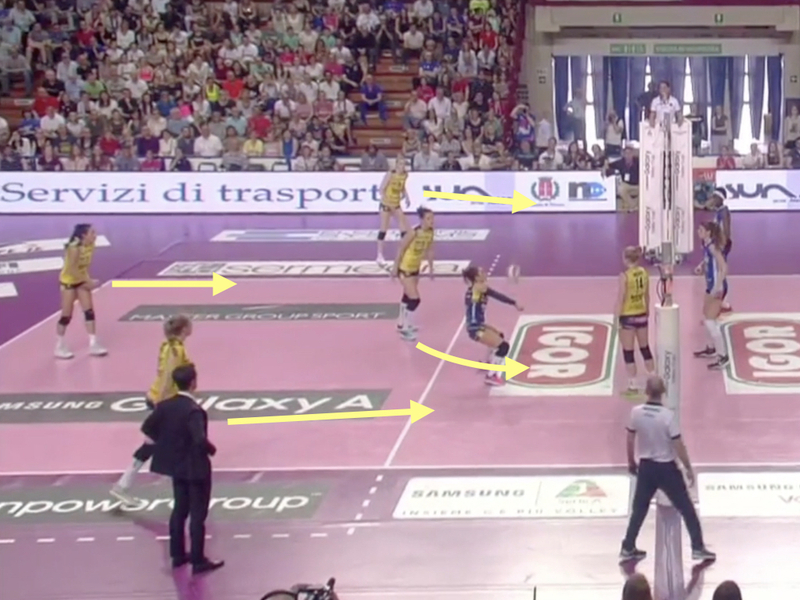 All three of Conegliano’s outside hitters routinely hit from the back row. In their last (and surprisingly lopsided) match, Conegliano was up 13-9 in the second set. My unofficial (but I think accurate) count was that 6 of those 13 points were from back row attacks: Fabris with 3, Bricio with 2, and Hill with 1. Nearly half their points came from a back row attack. I love the international quality of Conegliano, although this seems to be true of many of the teams in Italian Serie A1. Samantha Bricio, a Mexican national, is the other player I was acquainted with previously. While at USC, she received the NCAA National Player of the Year award. The obviously impressive part of her game is her serve. I dreaded when Stanford would play USC because her serve was so unsettling. Johanna Wolosz is the setter. She’s from Poland and seems pretty reliable—even-tempered but erring on the sunny side. Samanta Fabris, the opposite, is from Croatia. The job of the opposite in volleyball is to clean up garbage—an imperfect set is sent somewhere to the right side of the court and the opposite is supposed to do something with it. Fabris does this, routinely. She is a fabulous player. The back-up setter, Athina Papafotiou, who I think played for an injured Wolosz in the first game of this series, is from Greece. The rest of the team are Italian nationals including two remarkable middle blockers, Anna Danesi and Raphaela Folie (injured at the start of the second set of their last match and replaced by the undersized, but capable Laura Melandri) and a phenomenal libero, Monica de Gennaro, who routinely picks up bombs. The injury to Folie was tough to watch. One of the appeals for me about volleyball is that you see relatively few injuries. Folie’s knee buckled on her landing and her subsequent Instagram post suggests that repair and recovery is a long road ahead of her. In their latest contest, the play of the game won the the first set for Imoco Volley de Conegliano. I don’t know if this is the “best” volleyball play I’ve ever seen, but it was certainly impressive and memorable for both deception and execution. At least some, if not much, credit needs to go to the coach, Daniele Santarelli (who is married to de Gennaro, the libero). This play is a work of art. If a sporting event could ever be poetic, I think this is an example. Shall I compare thee to the end of day? Thou art more desolate and terminal. 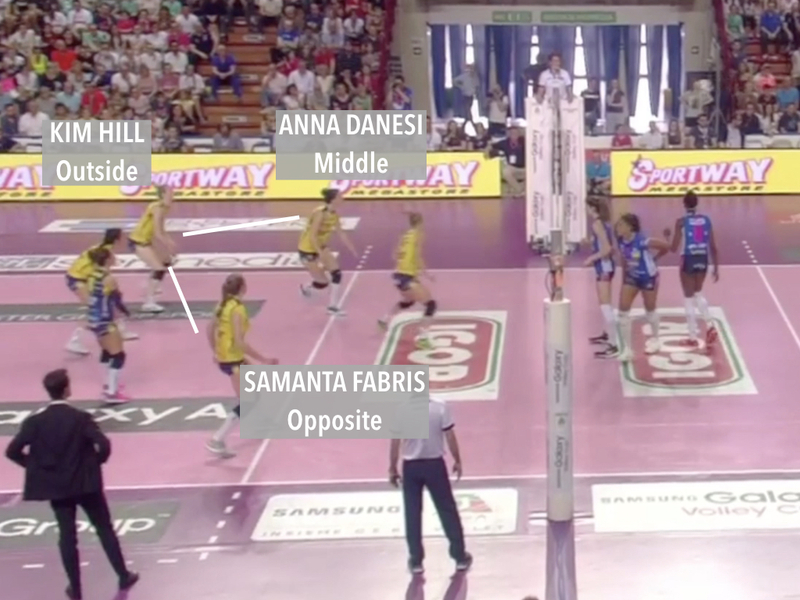 Conegliano is in its most powerful rotation, with three hitters up front: Danesi, who , after the serve is moving to the right to get into position as middle blocker (see photo below); Hill, who is back for serve-receive, and Fabris, over to the right. Any of these players can hit effectively and efficiently. Novara matches them in this rotation with three hitters up front. In the back row, Wolosz is moving forward following the serve to get into position and Bricio and de Gennaro (in for Folie, the middle blocker) are in serve-receive (with Hill). The play turns out to be a longish rally. Wolosz sets Fabris who is subsequently blocked and Conegliano gets the ball right back. Wolosz sets Fabris a second time. 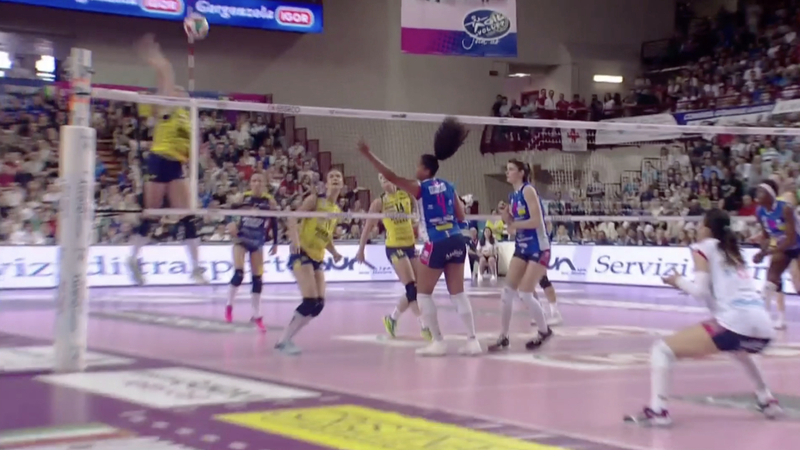 This time she gets the ball across cleanly and when it isn’t handled well by Novara’s setter, they scramble just to get the ball back over the net. It’s a free ball, which gives Conegliano some time to set up. For Conegliano, third time’s a charm. 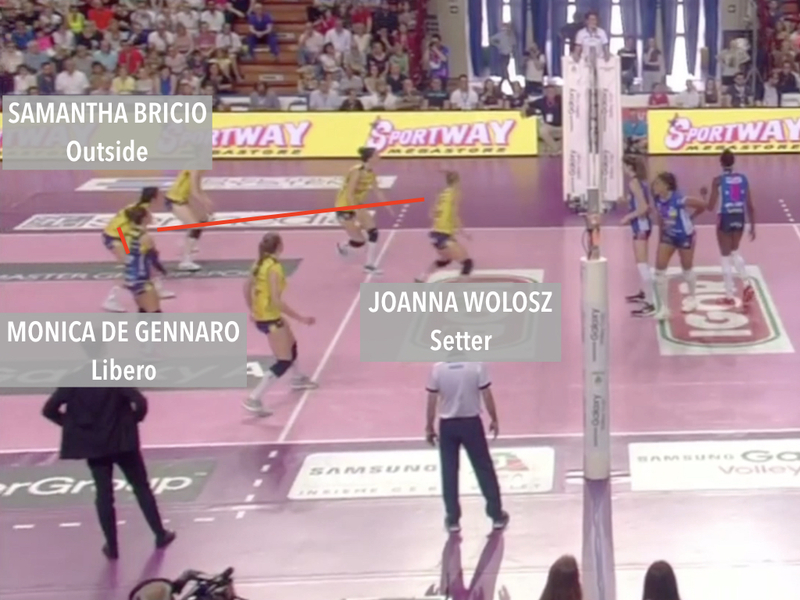 In the photo below, you see the player placement as the libero, de Gennaro, takes the free ball to pass to Wolosz. With Conegliano in system with loads of time to set themselves up, Novara has to contend with four attackers who are preparing to run hitting routes. The set could go to any of them. 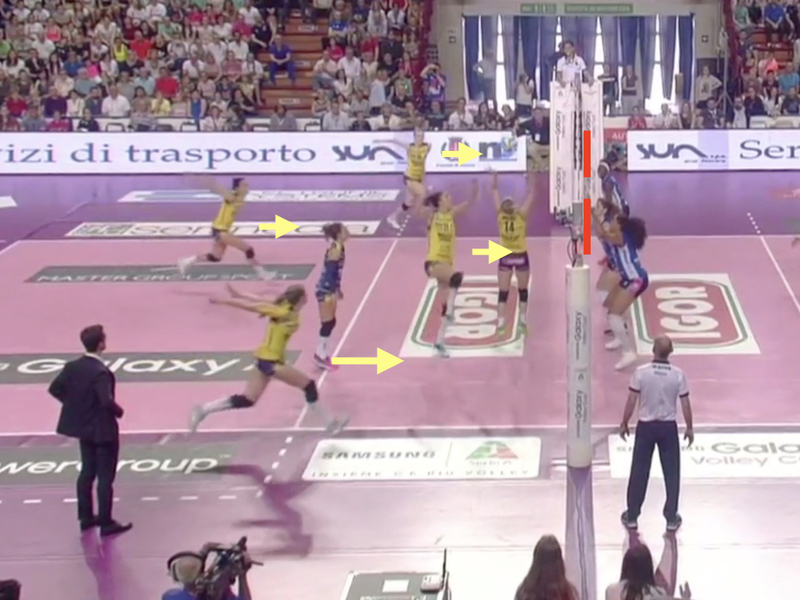 As Wolosz sets the ball (since she is playing “in the back row” for this rotation, she cannot attack and is no threat), Novara has established just two potential blocks, a single block by Egonu against Hill (far side of the court) and a double block in the middle against Danesi with Cristina Chirichella (middle blocker) and Celeste Plak (opposite). There are significant gaps between and next to the blocks where either Bricio or Fabris respectively could launch attacks without any potential interference. Every available attacker is running their route hard and looks as though the ball is coming to them. It’s an incredible sales job. It turns out that Plak’s commitment to assist in the middle fails dramatically. Danesi even sells her route so convincingly that she gets Plak to jump with her. Now there is a huge portion of the court left wide open. The set goes out to Fabris for the third time in a row and she crushes it. I think this is my favorite volleyball play of all time. You’ll never see anything like this on SportsCenter even though for me it has the emotional feel of a grand slam or a slam dunk over two defenders. One of the quirks of volleyball is that a point is a point. Where in baseball, for example, a grand slam gets you four runs, the play above earned Conegliano just one point, though it was the winning point of the first set and a real thing of beauty. Imoco Volley Conegliano took the Italian title yesterday. The match was on Conegliano’s home court, which is a loud environment. Very little recorded music is played during the match because the crowd is continually engaged in chant and song. (I think I heard something that sounds like “Popeye the Sailor Man” and the Beatles’ “Obladi Oblada” fairly continually.) It must be intense to play in that center. The one recorded song I hear from time coming out of a time-out is a portion of the Radetzky March, which gets everyone clapping and stomping. This was a terrific contest. Plenty of back-and-forth. The first set could have gone either way. Novara took the lead at 2-1 and held it until a tie at 6 points. Conegliano led 7-6. Novara came back 8-7. 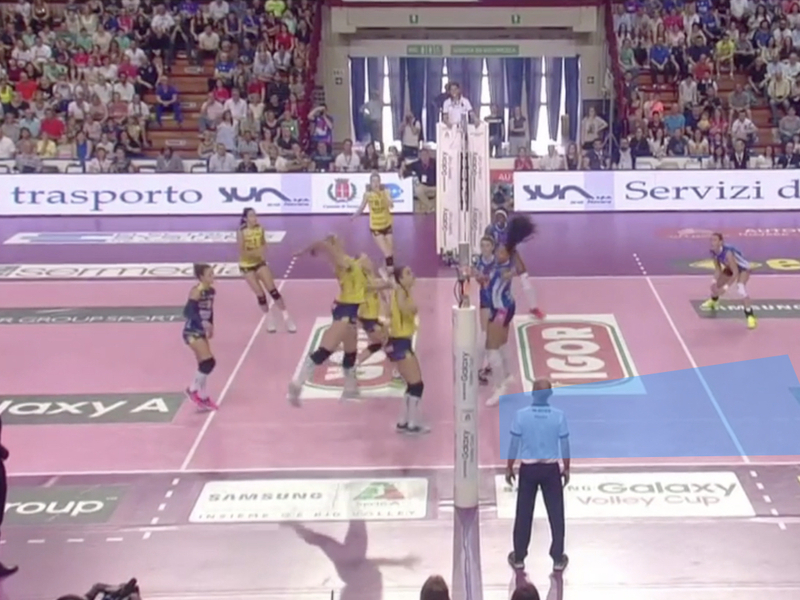 And then Danesi had a great serve rotation where Conegliano jumped ahead 11-8 and held the lead until a tie at 22. Novara had a set point opportunity at 24-23. Conegliano had its first set point opportunity at 26-25. Novara tied at 26. Conegliano won 28-26. Their last two points were a kill from Fabris followed by an attack error by Egonu. The latter was kind of sad because my count had Egonu with 10 kills in the first set. She was on fire until that set-ending misfire. Novara was up most of the second set, from a 3-2 lead until Conegliano tied at 16. Then, Fabris had a three-point run at the service line and Conegliano led until the end, with a 25-21 final score. Novara scored first. Conegliano tied at 1. But then Novara led the rest of the way. Coach Santarelli nearly orchestrated a sweep, though. Conegliano was down 21-17 when he made a double-substitution (swapping out both Fabris, the opposite and Wolosz, the setter, to keep three attackers in the front row). The substitution worked really well and Conegliano outscored Novara 5-2, getting within 1 point, 23-22 before reversing the double-sub. Novara scored two final points, including the set-winner by Egonu. The last set was odd. Novara had an early lead, 3-1. Conegliano came back to lead 4-3. Novara tied. And then that was that. Novara collapsed for reasons I don’t understand. The middle of the set was about extending the lead from 1 to 2 to 3 to 4 to 5 to 6 and then Samanta Fabris went to the service line with Conegliano up 17-11 and served four aces in a row. It was astonishing and devastating. Novara would score just one more point with the final score, 25-12. I liked the choice of Wolosz as finals MVP. Serving, setting, blocking, defense—so well-rounded. Love how she distributes the ball and how quickly the offense moves. You don’t know where the attack is coming from (including my count of four successful kills from her yesterday) because there are so many reliable weapons. Kim Hill picked up some real bombs today. She used to be a player you would target, but has developed so remarkably and obviously in her defense. Fabris was the player of the game though. She had a rough opening set (for her) with three attack errors, but then she settled in. Where Egonu became less consequential as the match went along, Fabris became more. As I watched Conegliano and Novara play, it was like the thermostats were set differently for each. When you set the thermostat at home there are two settings you need to think about: 1. What temperature do you want the house to be at? 2. How wide a temperature swing do you want from when the heat turns off until it comes back on? Imoco Volley Conegliano keeps the temperature warm, but not hot. And they keep it very consistent. The high’s aren’t too high and the low’s aren’t too low. There’s kind of a steely resolve and determination with this team coupled with what seems like a healthy sense of connection to and care for one another. They look like they are enjoying the game and each other. Playing competitively with great chemistry. In contrast, Novara seems to operate with wide temperature swings. They can be white hot but then things get icy.